Chicago is often cited as one of the favourite US cities among Europeans. Judging by the results of The Economist’s annual MBA ranking, they are equally enthusiastic about the city’s business schools. Chicago Booth retains the #1 spot for the third year running in the 2014 ranking published this week. It is the 5th time in the last 8 years that the school has topped the table. 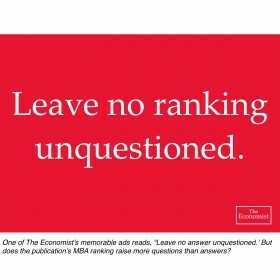 When The Economist published its first MBA ranking in 2002, neighbouring Northwestern Kellogg was #1, a position it held for the next two years. The school then saw its dominance slip, falling as low as #23 last year, before gaining ground again in 2014 to rank #14. This performance is much in line with its standing in the Financial Times ranking, where Kellogg lost ground from 2006 onwards, slipping to #24 in 2008. The arrival of Dean Sally Blount from McKinsey has since seen the school climb steadily in both international league tables. Dartmouth’s Tuck School of Business is the other US business school to have ranked #1, back in 2011. Spain’s IESE Business School and Switzerland’s IMD have also topped the ranking in the last decade, but while the former has maintained its position among the top 10 schools in the last five years, IMD has seen an alarming reversal of fortunes in recent years, mirroring a similar decline in BusinessWeek. Are the days of the European business school trinity of INSEAD, LBS and IMD consigned to the past? HEC Paris probably thinks so. Its position at #4 in this year’s Economist MBA ranking is the highest achieved by the French school, and indeed the highest of any European business school in 2014. The result comes on the back of HEC Paris securing the #1 place in the FT’s European Business School ranking for the seventh time in 8 years. But otherwise European business schools have little to celebrate in the 2014 results. There are only 6 schools in the top 25, compared to 11 schools in 2008. Business schools from the UK have been particularly hard hit since the financial crisis, with a case of the collective blues for Cambridge Judge and Oxford Saïd, which both fell by 15 places this year, to #52 and #69 respectively. But how can the analysis of an MBA ranking reach its sixth paragraph without having already mentioned Harvard, Stanford or Wharton? None of them make the top 5 this year, which is one of the reasons so many observers question the legitimacy of the results published by The Economist. Measured by applicant numbers alone, the three schools dominate the hearts and minds of many aspiring MBA applicants, and their world-class faculty and influential alumni networks speak for themselves. Could it be that by attracting many of the brightest and the best from top undergraduate institutions and blue-chip banks, consulting firms, and technology giants, Harvard, Stanford and Wharton are putting together an MBA class that already enjoys diverse career options, strong pre-MBA salaries and an influential network? Booth might make the same claim, but either way rankings will always be limited by the methodologies they use. More importantly, by familiarising yourself with the methodologies used by each media, and thinking hard about what most matters to you for your MBA experience, you can focus a little less on which is the ‘best’ business school in the world, and a little more on which is the best business school for you. The other criticism often leveled at The Economist’s MBA ranking is the volatility of the results, which this year see more than twenty schools rising or falling by double-digits. The 13th edition was certainly unlucky for the University of Bath School of Management, which fell 23 places from the #20 position it held last year. Canada’s York Schulich similarly dropped sharply, from #22 down to #41. These were the only business schools in the top 25 to see a shift up or down of more than 9 places. Meanwhile UCLA Anderson (up 5 places to #13), Kellogg (up 9 places to #14), INSEAD (up 8 places to #18) and Yale (up 9 places to #19) will all be pleased to see their year-on-year progress. Among the big climbers further down the list, Temple Fox and Rochester Simon led the way with jumps of 20 places to #57 and #58 respectively, with Warwick, EDHEC and IE Business School among European schools that performed well. Such big movements suggest how closely many schools compare with one another based on the criteria used by The Economist. A number of schools continue to stay away from the Economist ranking, including Babson College, Manchester Business School and Toronto Rotman. Claims of a shambolic methodology may tell some of the story, but schools will also pick their battles, as their presence or absence in the rankings of the FT, Forbes and BusinessWeek confirms. With BusinessWeek wrapping up the 2014 MBA rankings in mid-November, and the promise of some major changes to its methodology, expect to see some major changes in the MBA50 Premiership 2014, which combines the results of all five major rankings. Last year’s results can be viewed here.